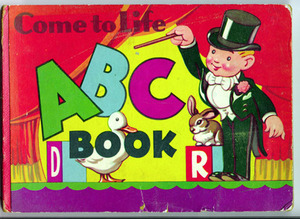 Come to Life ABC Book. London: Sandle, [1950s]. This work celebrates the beauty of the alphabet as a set of graphic forms. The letters appear on colorful blocks, surrounded by toys, creating an engaging classroom. We discover that "Y is for Yoke which the milk-maid carries on her shoulder when she brings home the milk," that the Union Jack is a "...fine Flag fluttering in the breeze," and that "Z is for Zoo, where I'm sure you've all been to see the animals and ride on the elephant." Giraud, S. Louis, ed. Bookano Stories [No. 7]. London: Strand, . Above we see an example of S. Louis Giraud's pop-up books in which figures and forms leap off the page with perfect swiftness. 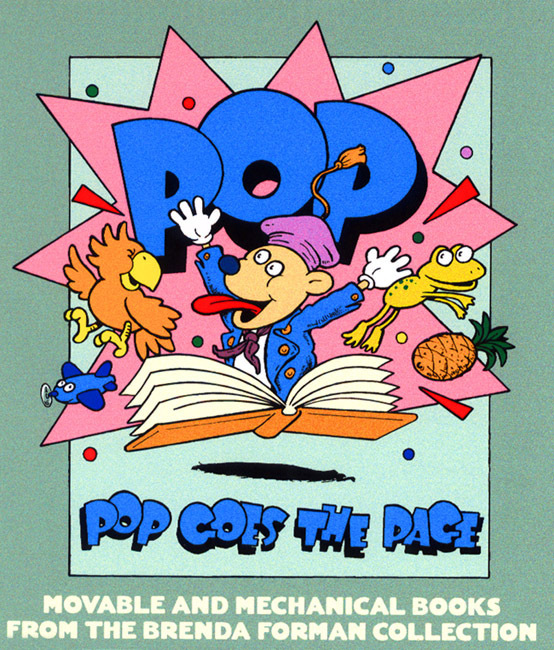 The paper structures, scenes, and vehicles which form the vocabulary of shapes in these books served as models for all of the Bookano series and were appropriated by later designers and publishers as well. Kubasta, Voitech. 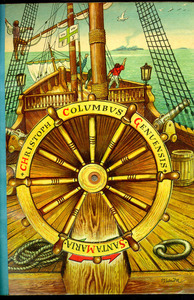 How Columbus Discovered America. [Prague]: Artia; London: Bancroft, . The talents of Czechoslovakian artist Voitech Kubasta brought a snappy, modern quality to the pop-up scene. His books, published by the Prague firm Artia, treat historical and educational topics in an approachable way. His unique style, with its bold drawings, vivid colors, and humorous detailing, makes his work instantly recognizable. In this book, the majestic Niña, Pinta, and Santa María loom over the indigenous people on shore, offering visual commentary on the momentous arrival of Western Europeans in the New World. Clyne, Geraldine, illus. 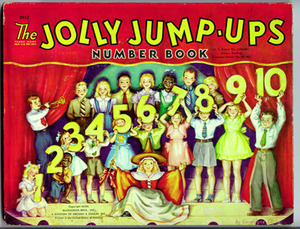 The Jolly Jump-Ups Number Book. New York: McLoughlin, 1950. The family, the Jolly Jump-Ups, popped into life at the end of the 1930s. The series chronicled family life in the twentieth century, especially showing the emerging post- World War II affluence. (See Jolly Jump-Ups section.) This Number Book presents the children in sentimental pastel colors and offers a number game with each new digit. 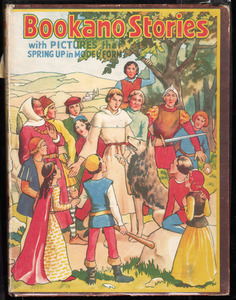 Its educational context relates to many of the other books in the series. We see again a heavy reliance on the tried-and-true themes of movables. 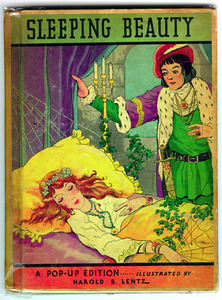 Lentz, Harold B., illus. Sleeping Beauty. New York: Blue Ribbon, 1933. This book is from the Blue Ribbon series, the 1930s American publication which re-energized pop-up production in a struggling Depression market. Basic design elements, coarse paper, and cheap imprints helped to cut costs, occasionally at the expense of the artistry. National Geographic Society. 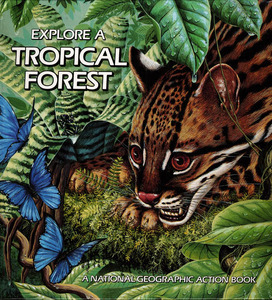 Explore a Tropical Forest. Illus. Barbara Gibson. N.p. : National Geographic Society, 1989. As evident in Explore a Tropical Forest, the advanced paper engineering and artistry of modern pop-ups expertly combine instruction and entertainment. This work belongs to a National Geographic series focusing on a wide variety of educational topics about nature and travel. It offers an idealized view of a tropical rain forest. Unlike the stiff mechanics of earlier animations, these complex scenes are intricate and beautifully drawn. They create subtle movements through complicated paper interactions.